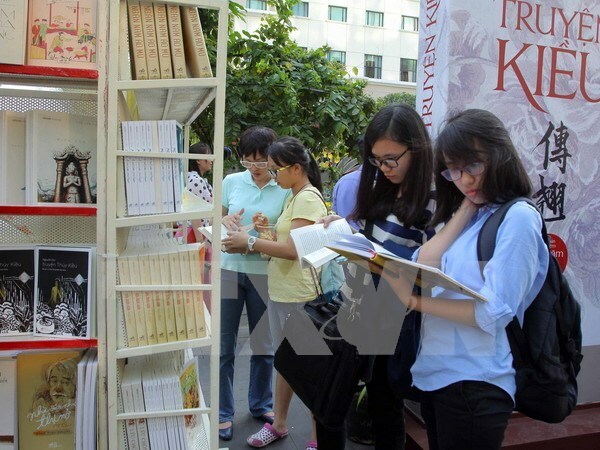 HCM City (VNA) – More than 240,000 copies of books have been sold on the Ho Chi Minh City Book Street after six months of operation, generating 15 billion VND (700,000 USD). According to the management board of the Book Street, the model drew more than 500,000 visitors over the past six months, 25 percent of them are foreigners. The Street features 20 booths from publishers including Phuong Nam Books, Nha Nam, Tri Viet, Nha Xuat Ban Tre (the Youth Publishing House), Nha Xuat Ban Van Hoa Van Nghe (the Literature and Art Publishing House), and Thai Ha Books. Ngo Mi Diem from the Van Lang University said she often visits Book Street with her friends to read and buy books. Tran Mai Thanh Tung from Binh Chanh district said he usually takes his family to the Book Street, adding that his children are very interested in the books. Huynh Thi Xuan Hanh, Director of the Van Hoa Van Nghe Publishing House said the street helps connect publishers with readers. The management board of the book street stressed the need for building a website to better connect readers with the street. Tran Thanh Viet, a salesperson at the booth of the Youth Publishing House said more investment should be made in expanding the children’s playground to encourage more families to visit the street. By the end of this year, a number of book collections will be showcased on the street and discounts will be offered to frequent customers. The board will also meet with the municipal Department of Tourism, and local and foreign travel agents to promote the street as a tourism destination.